WASHINGTON (AP) — Battling brain cancer, John McCain on Thursday vowed to return to the Senate, leveling fresh criticism at the Trump administration and aiming a good-natured dig at Republican and Democratic colleagues shaken by news of his diagnosis. “I greatly appreciate the outpouring of support — unfortunately for my sparring partners in Congress, I’ll be back soon, so stand-by!” McCain said in a tweet. Showing no signs of stepping back from political and national security battles, he issued a statement slamming the Trump administration over its Syria policy. The 80-year-old McCain, the GOP’s presidential nominee in 2008 and a six-term Arizona lawmaker, was diagnosed with glioblastoma, an aggressive type of brain cancer, according to doctors at the Mayo Clinic in Phoenix, who had removed a blood clot above his left eye last Friday. They also managed to remove all of the tumor that was visible on brain scans. The senator and his family are considering further treatment, including chemotherapy and radiation, as he recuperates at his home in Arizona. President Donald Trump called the senator on Thursday, said a White House official who spoke on condition of anonymity to discuss private talks. In a blistering statement through his office, McCain criticized the administration over reports that it was ending a program to assist Syrian opposition forces fighting the government of Bashar Assad. More significantly, McCain’s absence complicated Republican leader Mitch McConnell’s plans for a Senate vote on a GOP health care bill to erase much of Barack Obama’s law. A vote is possible as early as Tuesday, but Republican defections plus McCain’s likely absence could sink any chance even to get started. McCain’s closest friend in the Senate, Lindsey Graham of South Carolina, said that they had spoken by telephone Wednesday night and that the diagnosis had been a shock to McCain. But Graham said “woe is me” is not in McCain’s DNA. “One thing John has never been afraid of is death,” said Graham, who said he expects McCain to be back at the Capitol. 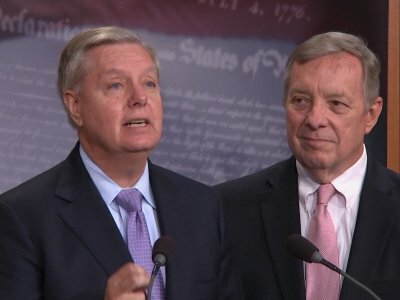 Prior to a Thursday news conference on immigration legislation, Graham said McCain called him three times. “He is yelling at me to buck up, I’m so going to buck up,” Graham said. It was unclear how long McCain might be out. Earlier this year, Sen. Johnny Isakson, R-Ga., missed several weeks after undergoing back surgery. Former Sen. Mark Kirk, R-Ill., was out for nearly a year after suffering a stroke in 2012. Meantime, prayers and words of encouragement flowed in Thursday from presidents and Senate colleagues past and present. According to the American Brain Tumor Association, more than 12,000 people a year are diagnosed with glioblastoma, the same type of tumor that struck McCain’s Democratic colleague in legislative battles, the late Ted Kennedy of Massachusetts. The American Cancer Society puts the five-year survival rate for patients over 55 at about 4 percent. McCain, a former combat pilot, has a lifetime of near-death experiences — surviving a July 1967 fire and explosion on the USS Forrestal that killed 134 sailors, flying into power lines in Spain, being shot down in October 1967 and falling into Truc Bach Lake in Hanoi, and going through 5 1/2 years in a North Vietnamese prison. In the past, McCain had been treated for melanoma, but this primary tumor is unrelated. Doctors said McCain is recovering from his surgery “amazingly well” and his underlying health is excellent. AP Medical Writer Lauran Neergaard and writers Nancy Benac, Erica Werner and Jill Colvin contributed to this report.